Have you even wanted to get started on a home project, only to be put off by the amount of tools that you need, yet don't have? Campbell Hausfeld has four new starter kits that just might get you back into the DIY mood again. They idea is pretty simple, you choose the kit that best suits your needs, then you can get started on those projects right away. The Home Décor Kit (Model FP260096) is for the person that likes to do crafts, reupholster furniture, do a bit of artistic painting, etc. This is a kit you might find a designer on TV using. The kit includes: 1-gallon air compressor, storage bag, 3/8 in. upholstery stapler, staples, pin nailer, pin nails, staple remover, sanding block, plug, coupler, 24 foot air hose, project DVD, and Bonus air brush kit. Suggested retail is $140. The Home Improvement Project Kits are for, you guessed it, home repair. They offer many of the tools you would need for those common household repairs and upgrades. 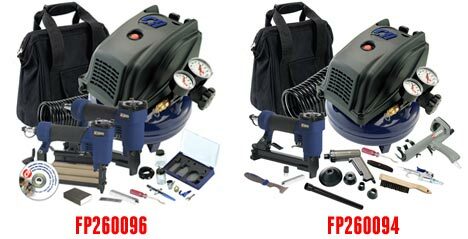 Both of these kits include a larger 2-gallon air compressor that is ideal for tire inflation, and larger nail guns. One of these might be the perfect gift for the first time homeowner.